YouTube has become the go-to consumer source for 16- to 45-year-olds, 10 years after it was founded, research has found. Nearly half (42.4 per cent) of 500 respondents in a OnePoll survey said they trusted YouTube over any other source when it came to looking for products or services. An overwhelming 89 per cent said they were more likely to buy a product after seeing a good review on YouTube. Magazines placed second (23.2 per cent), TV third (14.4 per cent) and then radio (two per cent). Approximately a fifth of people (18 per cent) said they preferred other sources. 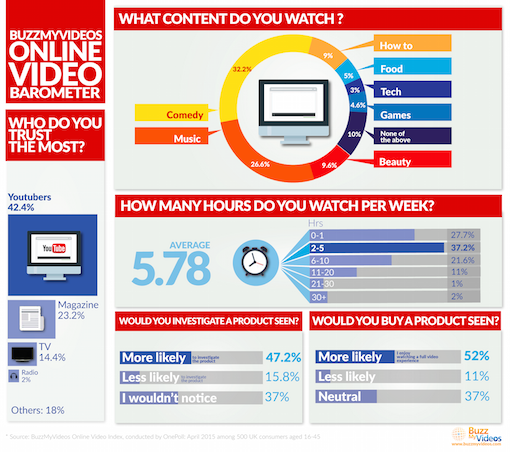 The findings also revealed that close to a quarter of all respondents (22 per cent) watched between six and 10 hours of online video every week. On average people watch 5.78 hours of online video per week. YouTube is still mainly used by people to watch comedy and music, with these two categories making up a combined 58.8 per cent of content. Finding ‘how-to' videos and beauty tips is also popular. Paola Marinone, co-founder and chief executive of BuzzMyVideos, said: "The UK is a nation with a huge appetite for online video with usage growing fast among all ages, demographics and locations. "Our Online Video Barometer has revealed an incredible level of trust in YouTubers both as entertainers and influencers among the general public. This credibility marks a clear cultural shift and one that brands in all sectors need to very quickly switch on to."